Young soldiers march in Asmara during Eritrea’s Independence Day celebrations, as the country went on alert for possible war over a border dispute with Ethiopia in May 1998. That year, my family and I were among the estimated 75,000 Eritreans who were deported from Ethiopia at the start of a two-year border war, followed by a protracted cold war that ended this year in a formal declaration of peace. Twenty years have passed since that conflict uprooted thousands of families like mine. But the costly antipathy between Eritrea and Ethiopia goes back much further. During World War II, both states became battlegrounds in the fight against Italian imperial rule. After the war, the United Nations passed a United States-backed resolution to form a federation between the two countries. In 1962, however, Ethiopia annexed Eritrea, stripping its language, culture and ability to self-govern. A decades-long armed struggle for independence followed, and tens of thousands of men and women, including my uncle, lost their lives as resistance fighters to win back Eritrea’s sovereignty. I would learn these things much later in life. Born and raised in Addis Ababa, Ethiopia, I attended a Catholic school and was sheltered from politics. I overheard bits and pieces about the war, but I was more concerned with the latest fashion trends and my first crush. Politics became unavoidable when Eritrea gained independence in 1993. Once, when I returned to Ethiopia from visiting my grandparents in Asmara, Eritrea’s capital, a classmate thrust a Nakfa bill, the new Eritrean currency, in my face and told me it was worthless. Another time, I saw a magazine cover with a painting of a woman wearing a traditional scarf in the shape of an old Ethiopian map. 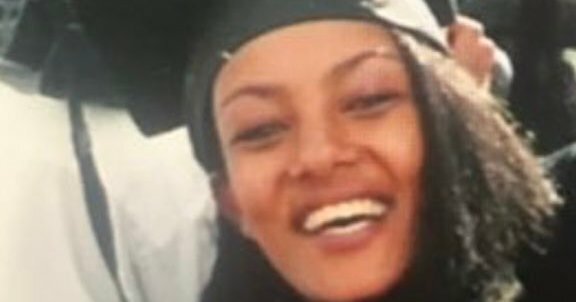 A noose around her neck suggested Eritrea’s independence had strangled “Mother Ethiopia.” Friends singled me out to explain political developments because I was Eritrean, but I didn’t know how to answer. After the Ethiopian government announced plans to deport people of Eritrean origin, neighbors began eyeing our property and belongings as if they were creating an inventory before an auction. Some we had known for as long as I could remember; my parents, a surgeon and a nurse, had treated them when they needed care. We felt helpless and betrayed, suddenly isolated in a community we had considered home. I was a teenager when a loud knock at our door at 4 a.m. upended our lives. One of my brothers and I looked through our front door’s thick glazed glass onto the dimly lit porch. Two men and a woman stood there holding AK-47s. We opened the door, and the armed agents asked for Dr. Solomon. My father, still in his pajamas, appeared. They gave him a few minutes to change. My mom handed him his coat and a gabi — a traditional wrap — to keep warm, but he wasn’t allowed to collect other belongings. I asked the soldiers what was happening. “Where are you guys taking him? Why are you here?” They ignored my questions and took my father away. We later learned that my father had been taken to a detention facility in the neighborhood’s administration center, along with other Eritreans targeted for deportation. He had voted in the referendum for independence, and that, along with his stature as a doctor and professor at a top university, most likely made him a target. Four days later, they were loaded onto buses, driven to the border and told to get off. My father called us from Adwa, a town in northern Ethiopia, to tell us he was safe. Soon after, he crossed the border and traveled to Asmara, where he would wait for us to join him. Tense days followed back home. My brothers left immediately for Kenya using their Ethiopian passports, but I had trouble securing travel documents with my mother. Even though my birth certificate showed I was born in Addis Ababa, I was denied a passport when we went to the immigration office because my parents were born in Eritrea. Instead, an officer gave me and my mom a “laissez-passer” document and told us we had 10 days to leave the country. As we prepared to leave, neighbors came to visit. Some offered to help; others offered to buy our furniture or our car. Everything my parents owned was left behind or sold. Their bank accounts were frozen, and my father lost his stake in his medical practice. On the last day, I clung to my childhood best friend, an Eritrean who had not yet been targeted for expulsion. We both sobbed. Arriving in Eritrea was a culture shock for my brothers and me. While Addis Ababa is a cosmopolitan city, Asmara is smaller and slower; it’s not uncommon to see goats herded down the main roadways. But the most noticeable difference was the presence of uniformed soldiers on street corners. ID checks were common to keep tabs on people and ensure that those required to join the military served. My father took a job teaching at Asmara University’s medical school, and we moved into cramped university housing. My mother continued to practice nursing, and my brothers arrived from Kenya and enrolled at the university. Thirty years of war had hardened Eritrea, and the border war only deepened the scars. I knew just how close we were to conflict when, one day, I saw a fighter jet fly low overhead, roaring so loud that it shook the window panes. When I began 11th grade, I tried to assimilate, but the cultural differences were pronounced. Deportees were called amiche, a reference to Italian cars assembled in Ethiopia with parts manufactured in Eritrea. I was an outspoken student, accustomed to raising my hand and proudly answering questions. In Asmara, that drew angry stares from my classmates, who weren’t used to a young woman speaking her mind. As I was finishing that school year, Ethiopian troops advanced to Barentu, a town 90 miles west of Asmara. The entire country was mobilizing, and thousands of high school students, myself included, were sent to military training in Gahtelay — a desert town of makeshift encampments constructed after the main camp, Sawa, had become a target for Ethiopian airstrikes. For three months we slept on a riverbed, protected from wind-driven sands by bedsheets strung together and held up with sticks. Every day before dawn we marched in plastic sandals, sometimes stopping to pull inch-long acacia thorns out of our feet. We learned how to fire AK-47s and handle grenades. Dust storms coated us from head to toe, and we endured temperatures well above 100 degrees. I tried to help keep morale up and would sing, on request, songs by Usher and Celine Dion during breaks. At one point, I fell down during a drill and was treated at a clinic for dehydration. Every night, I would lie down on the riverbed and look up at the sky. I prayed to see a shooting star, a sign that someone was watching out for me. Soon after we finished our training, it was rendered moot. Ethiopia’s advances came to a sudden halt when a peace agreement was signed. Our round of recruits, the 13th, was called the “peace round,” but the cold war between Eritrea and Ethiopia continued until this summer’s peace declaration by Prime Minister Abiy Ahmed of Ethiopia and the Eritrean president, Isaias Afwerki. The border conflict kept many families separated for nearly 20 years. In addition to the people like me who were deported from Ethiopia, some 70,000 Ethiopians were expelled from Eritrea. What all deportees share is a knowledge of how fragile nationality and identity can be. We were born in a country and believed we had basic birthrights as citizens. Instead, we learned that ruling politicians can make any excuse to take those rights away — even not liking the color of our eyes.